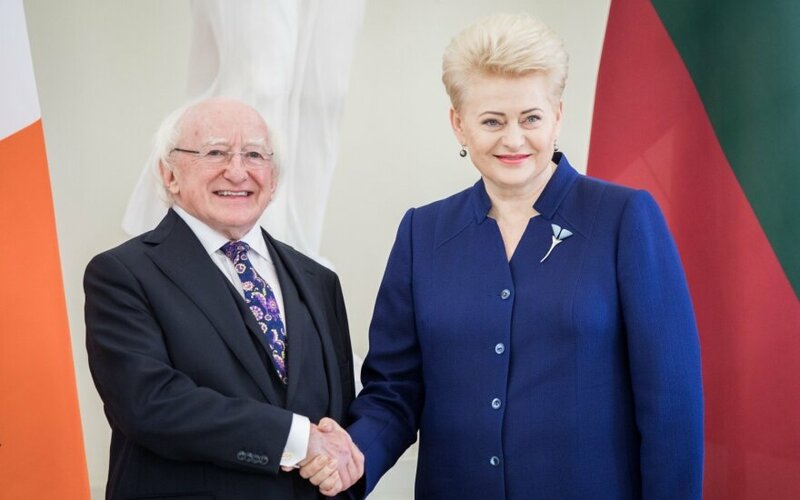 Lithuanian President Dalia Grybauskaitė met with her Irish counterpart, Michael D. Higgins, in Vilnius on Tuesday. Ireland worries about a possible border with British-ruled Northern Ireland after the United Kingdom leaves the European Union. Ireland wants the border to remain open and tries to drum up diplomatic support. Lithuanian President Grybauskaitė said after Tuesday's meeting that people and countries should not be artificially separated in peacetime. Ireland is considering establishing closer ties with the group of Nordic and Baltic countries: the Irish and Dutch prime ministers were for the first time invited to attend a traditional meeting under this format last year. In talks on the EU's future budget, both Lithuania and Ireland seek to secure the maximum possible funding for agriculture. Official statistics show that about 40,000 Lithuanians live in Ireland, but Lithuanian officials believe that the real number is twice as high. Some schools in Ireland will offer Lithuanian language courses to children aged 12 to 16 years starting next September. The Irish president said at a joint news conference on Tuesday that Lithuanians "are very welcome" in Ireland as they are "a community that is making a very positive contribution not only economically, but also culturally". The volume of trade between the two countries is not high, at around 200 million euros annually. The Lithuanian president described Ireland as a successful example of economic growth and of attracting immigrants back to the country. It is estimated that Irish companies have created around 2,000 jobs in Lithuania. Diplomats see opportunities for increasing Lithuanian food product and building material exports and strengthening cooperation in life sciences and financial technologies.